Laser cutting is an additional service of Elecrow since last October, which is ideal for making custom parts quickly and economically for any project. We adopt the accurate technology and try our best to ensure the quality of the products. The laser cutting service can provide you with various Acrylic colors which include transparent, black, purple, white, blue, green, red and yellow, etc. The specific parameters of the color please reference our details. The thickness of the full transparent Acrylic can be 2-12mm and about 2.5-3.0mm with the others colorful boards. There will be 0.15mm-0.2mm tolerance for the materials of different color. In addition, you can select the unique technology to make your products looks different that is graving some logos, bending angle of 45 and 90 degrees or Arc bending, bevel, buffing, channeling, punching, tapping, and painted, etc. Besides, you can design your favorite Acrylic products that upload your files to our website or custom dozes of Acrylic products with this service. We also provide wood laser cutting service, click on this wood laser cutting service page to know more. For easily making, please use "mm" as the unit of your design. And the EPS, DXF and CDR or PDF file format is acceptable. Different software will make the dimension look different, in order to minimize the error, please mark the outline dimension in your design or use a txt file in the zip file to let us know the correct dimension. Customers can make several parts in one design but make sure the outline dimension within the limits of the dimension you choose on our website. If you really want other thickness colorful boards, you can leave a comment for special thickness. We will contact you if it needs some extra fees for it. For batch manufacture (50+ units for one design), you can contact us for the discount. 1. The material is Acrylic (PMMA). 2. Have multiple appearances, such as start, rectangle, circles, and some complicated figure, etc. 3. Have smoothly edge and will not hurt hand. 4.Applied range: hotel, company, market, advanced conference room, the office place and all kinds of the business hall. Furthermore, it can use for decoration in the family. No.1 Laser cutting, it can cut too complex graphics, such as polygon and so on. No.2 Graving, which includes Yin carving and carving that adopting the new laser and light projections technology. No.3 Bending, an angle of 45 or 90 degrees. Full angle of science bent, durable and beautiful. No.4 Arc Bending, which is a fast and convenient technology about professional profile bending. 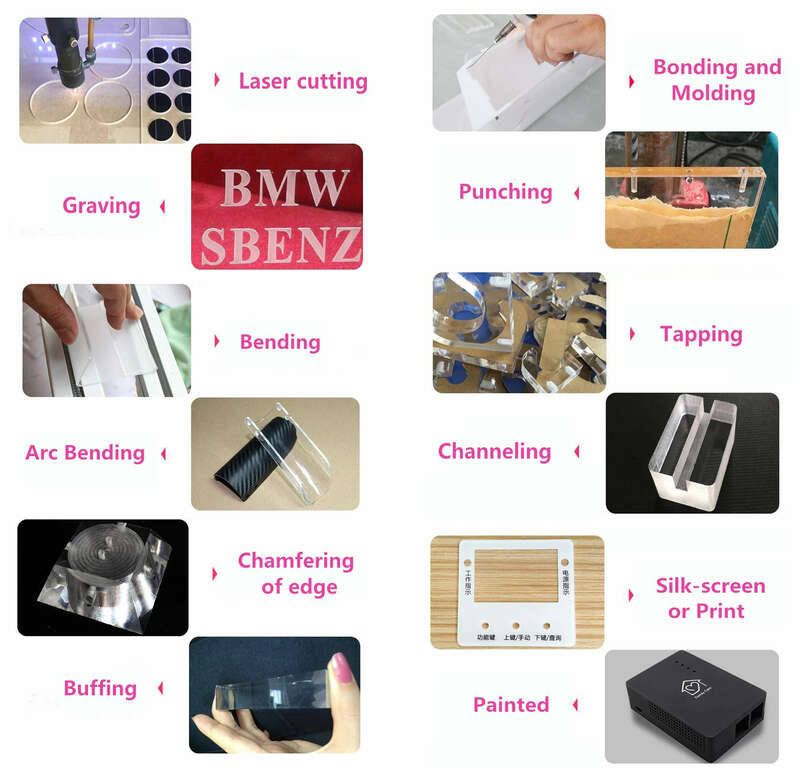 No.5 Chamfering of edge, it can produce the smooth edge and will not hurt your hand. No.6 Buffing that made the product like diamond and the technical definition is as high as 95% above. No.7 Bonding and Molding that is waterproof seamless combined bending. No.8 Punching, we can open side hole, inclined hole, countersunk head blind hole and don’t leaned accurately. No.9 Tapping, which is a Professional and stable technology, highly accurate and has the clear thread. No.10 Channeling is that made a groove milling machine clean level, beautiful appearance. No.11 Silk-screen or Print, which is color printing and the products are carved milling material color. No.12 Painted Using the grind arenaceous black spray paint, after four working procedures and not easy to fade durable. I am impressed by the accuracy of the result. I ordered frontplates and they were exactly like I designed them. A tenth of a millimeter is not a challenge for the cutting service. Very nice: There is no need to finalize the parts.